Background In 2012, a European initiative called Single Hub and Access point for pediatric Rheumatology in Europe (SHARE) was launched to optimise and disseminate diagnostic and management regimens in Europe for children and young adults with rheumatic diseases. Juvenile idiopathic arthritis (JIA) is the most common rheumatic disease in children and uveitis is possibly its most devastating extra-articular manifestation. Evidence-based guidelines are sparse and management is mostly based on physicians’ experience. Consequently, treatment practices differ widely, within and between nations. Objectives To provide recommendations for the diagnosis and treatment of JIA-associated uveitis. Methods Recommendations were developed by an evidence-informed consensus process using the European League Against Rheumatism standard operating procedures. A committee was constituted, consisting of nine experienced paediatric rheumatologists and three experts in ophthalmology from Europe. Recommendations derived from a validated systematic literature review were evaluated by an Expert Committee and subsequently discussed at two consensus meetings using nominal group techniques. Recommendations were accepted if >80% agreement was reached (including all three ophthalmologists). Results In total, 22 recommendations were accepted (with >80% agreement among experts): 3 on diagnosis, 5 on disease activity measurements, 12 on treatment and 2 on future recommendations. Conclusions The SHARE initiative aims to identify best practices for treatment of patients suffering from JIA-associated uveitis. Within this remit, recommendations for the diagnosis and treatment of JIA-associated uveitis have been formulated by an evidence-informed consensus process to suggest a standard of care for JIA-associated uveitis patients throughout Europe. With the rapid development of novel therapies for JIA, clear recommendations based on available best evidence and expert opinion (when trial evidence is lacking) will help physicians in the care of patients with JIA-associated uveitis. The uveitis seen with JIA is usually chronic anterior uveitis which is asymptomatic, but acute anterior uveitis can also be seen in the enthesitis-related arthritis subtype.7 8 There is a clear need to regularly update those managing patients with JIA uveitis through expert opinion. While the majority of treatments available for the treatment of arthritis have a solid evidence base from clinical trials, corresponding data for patients with uveitis may not be known or the level of evidence may not be as strong at the time of their introduction into clinical practice. recommend treatments and management strategies that would reduce inflammation and prevent the development of those ocular complications most likely to cause irreversible visual loss. The electronic databases PubMed/MEDLINE, Embase and Cochrane were searched independently by two researchers for eligible articles in February 2015. All synonyms of JIA were searched in Medical Subject Headings/Emtree terms, titles and abstracts (figure 1). Reference tracking was performed in all included studies (full search strategy is shown in figure 1). Experts (TC, AP, VB) selected papers relevant to uveitis associated with JIA investigations and/or treatment to be taken forward for validity assessment (inclusion and exclusion criteria shown in figure 1) by members of the expert committee. Summary of search strategy for identification of key articles. As part of the EULAR standard operating procedure, experts described the main results and conclusions of each paper, along with their validity and level of evidence. These descriptions were collated by five experts (TC, GS, YU, RG, JdB) and used to formulate provisional recommendations which were reviewed by a panel of three experts (IF, NW, JdB). A summary of the evidence was presented along with each provisional recommendation to the expert committee. The recommendations were revised and discussed at a face-to-face meeting in March 2014 (Genova: 12 participants), using a Nominal Group Technique to reach a consensus.12 A non-voting expert (AR) facilitated the process. Recommendations were accepted when ≥80% (10 of 12) of the experts agreed (including all three ophthalmologists). The literature search yielded a total of 1323 papers which, after deduplication, left 1259 unique articles. Evaluation of inclusion/exclusion criteria in titles and/or abstracts resulted in a core reference database of 176 articles for which full-text copies were obtained for quality screening by the expert committee. Of these, 117 were selected to support the development of consensus-based recommendations by the expert group (figure 1). The sections that follow report the recommendations of the expert committee based on the supporting literature.13–128 Tables 1–4 summarise the recommendations, the level of evidence that they provide and the strength of the recommendation, and the percentage of experts who agreed with these assessments. Structural complications, some of them leading to irreversible visual loss, include cataracts, glaucoma, band keratopathy, macular oedema, retinal detachment and sequelae associated with chronic hypotony. The uveitis usually has an insidious time course and can be chronic or recurrent but, most frequently, JIA-associated uveitis is a chronic relapsing condition lasting several years. It almost universally starts as an anterior uveitis, but in rare instances can become a panuveitis. JIA-associated uveitis is usually asymptomatic in the age group in which it most commonly develops (age 3–7 years), but severe inflammation may cause symptomatic pain and redness and these symptoms and signs, as well as pupil distortion, may be noticed by carers and lead to early referral. Reduced visual function is an uncommon cause of presentation in small children unless it is severe and usually secondary to irreversible structural damage. The presence of antinuclear antibodies (ANA), oligoarthritis and early onset of arthritis are predominant risk factors for chronic anterior uveitis in those with JIA, and improved identification of children at risk is a key priority for targeted screening programmes. This exercise only looked at chronic anterior uveitis associated with JIA and not at acute anterior uveitis seen in human leukocyte antigen (HLA) B27-positive children with enthesitis-related arthritis. Advances in genetics have not found any more specific diagnostic markers than the HLA types originally reported as being associated with both oligoarticular disease and uveitis.14 15 30 32 38 48 50 56 There is no evidence, at present, that genotyping adds specificity to the established clinical risk factors on which contemporary screening programmes are based. There is a clear unmet need to adapt screening policies to the contemporary usage of early systemic immunosuppressant treatment of arthritis57 61 62 64 and novel biomarkers and future genotyping may improve targeting of the population being screened. The risk of visual symptoms and potential for relapse in patients initially responding to treatment highlights the necessity for maintained regular close ophthalmological scrutiny. The expert group recommended that the frequency of ophthalmological follow-up should be based on ocular disease severity and decided upon in conjunction with an expert ophthalmologist. Methotrexate (MTX) is the immunosuppressive therapy of choice in patients with JIA-related uveitis (see recommendation 14, table 3). Once long-lasting remission of uveitis is achieved, MTX is usually stopped, but the optimal period of disease control prior to withdrawal of both topical and systemic treatment remains unclear. Patients stopping MTX are at risk of developing new onset uveitis or recurrence of uveitis after prolonged remission in the first year. Indeed, the majority of patients in a recently reported series relapsed within 24 months of stopping therapy.67–70 Consequently, after stopping immunosuppression with MTX (prescribed for arthritis or uveitis) it is recommended that all patients with JIA are screened by an ophthalmologist at least every three months for a minimum of 1 year. It also remains unclear for those patients on multiple treatments, in which order treatments are best withdrawn. Relapse of uveitis after withdrawal of MTX appears to be delayed in older patients, those who have been on treatment for longer duration.67 The authors recommended that the period of uveitis inactivity should be >2 years before MTX is withdrawn.67 The expert group also recommend that patients should have 2 years of inactive disease while not using topical steroids before reducing systemic immunosuppression. There is a clear need for continuing monitoring in the early period of remission after medications are stopped, especially in patients on long-term therapy, topical or systemic, which had maintained disease control. The expert group recommends that monitoring of disease in remission by an ophthalmologist should be at least every three months and should continue for at least 3 years off all forms of treatment. The length of remission best predicting lifetime remission remains unknown. More robust data on effective screening strategies are required. A pivotal goal in the management of JIA-associated uveitis is to minimise loss of vision through the early diagnosis of ocular morbidity. Early referral and appropriate treatment to eliminate ocular inflammation are seen to be crucial in preserving visual acuity. Visual loss is mainly caused by glaucoma, macular damage from inflammatory oedema, hypotony or amblyopia: structural damage can occur prior to diagnosis and also arise following years of poorly controlled inflammation. Based on past usage, the expert group recommend that topical corticosteroids (preferably prednisolone or dexamethasone) are the first-line treatments of choice for both acute and chronic anterior uveitis.4 5 81 129 Children with JIA-related uveitis are frequently treated with topical corticosteroids over extended periods, and this increases the risk of cataract formation and glaucoma. One study found that the increased risk of cataract formation with high-dose topical steroids was independent of active uveitis or presence of posterior synechiae.81 The risk increased as the number of drops of topical corticosteroids instilled increased. The data suggested that patients may be treated with low doses of topical corticosteroids (≤3 drops daily) over moderate periods of follow-up (median 4 years; range 0.5–15 years) with a low risk of developing cataracts.81 Among eyes receiving ≤2 drops daily, the incidence of cataract was 0/eye year. There appears to be no evidence to suggest that less potent topical steroids reduce adverse effects in this patient population (table 3). Systemic corticosteroids are not usually preferred in children due to risks of growth suppression and osteopenia; however, they are potentially helpful in individual cases for rapid control of severe uveitis or in the presence of macular oedema. In a retrospective study, the adjunctive use of non-steroidal anti-inflammatory drugs (NSAIDs) for the treatment of chronic iridocyclitis was evaluated in 14 patients, 8 with JIA and 6 with idiopathic iridocyclitis.82 In all patients, the activity of the iridocyclitis improved with the addition of NSAIDs to their treatment regimens, permitting reduction in the dose of corticosteroid drugs. These data suggest that NSAID therapy may have an adjunctive role in the treatment of chronic iridocyclitis in childhood, but not as monotherapy. Based on findings of efficacy and tolerability/safety from a number of studies, the expert group recommended that MTX is the immunosuppressive therapy of choice in patients with JIA-related uveitis.68 84 88–90 Other forms of immunosuppressive therapy such as azathioprine, sulfasalazine, mycophenolate mofetil, cyclosporine and leflunomide have been assessed in patients with uveitis, often in MTX-resistant cases.91 95 The studies have generally included a small numbers of patients, and in the case of cyclosporine, the clinical efficacy was poor and the authors noted that it has limited value in this indication.94 The results with other forms of immunosuppressive therapy were more encouraging, but were in fewer patients.91–93 95 At this stage they may prove to be useful treatment options in patients not responding to, or who cannot tolerate, MTX and they also have a place accompanying biological treatment in those who are MTX-intolerant. There is also evidence of the greater effectiveness of MTX in controlling arthritis in JIA compared with other conventional immunosuppressants. It is not uncommon for treatment to fail when treatments other than MTX are used because of recurrent arthritis rather than failure to control the uveitis. The use of TNF inhibitors in uveitis was hypothesised based on their proven efficacy in a range of systemic inflammatory disorders including JIA, rheumatoid arthritis and Crohn’s disease.109 Etanercept is a recombinant DNA dimeric fusion protein that antagonises TNF-α, and it has proven to be effective in children with polyarticular JIA.118 Evidence for the clinical benefit of etanercept in uveitis has generally been disappointing; it was associated with a high relapse rate and a high risk for developing uveitis flares.87 100 109 117–121 Based on these findings, the expert group recommend that etanercept should not be considered for JIA-associated uveitis. In keeping with an earlier recommendation (18, table 3), there are data from small studies that in patients with JIA-related uveitis refractory to conventional therapy and at least one anti-TNF therapy switching to drugs such as abatacept, rituximab or tocilizumab may be beneficial.123–125 This included patients in whom the main cause of poor visual acuity was macular oedema.125 There is now growing evidence for the role of tocilizumab in macular oedema associated with uveitis.140 141 There is also an ongoing trial of tocilizumab in children with anti-TNF refractory JIA-associated uveitis (http://www.aptitude-trial.org.uk/). A MIWGUC identified the need for clinical trials and longitudinal studies to determine the benefits and costs of health interventions in this setting.74 To achieve this the group proposed a core set of outcomes aimed at ensuring that changes in relevant outcomes were measured, and that standardisation of outcome measures would facilitate data pooling and comparisons between interventions (tables 4 and 5). The outcomes should be agreed on by both researchers and patients, and they will provide a common focus for interventional studies. Disease-specific and universally agreed on validated outcomes are likely to reduce selective reporting and reporting bias.74 A limitation of this core set of outcomes is that, despite the fact that there was consensus by the Working Group regarding their utility, they still remain unvalidated. Visual impairment has a significant impact on the quality of life (QOL) of patients with JIA-related uveitis and vision-related QOL relates to the degree to which vision impacts the individual’s ability to perform activities of daily living as well as social, emotional and economic well-being.126–128 The Effects of Youngsters’ Eyesight QOL is a useful instrument for measuring the effects of uveitis on QOL which is currently being validated. The expert group indicated a need for more well-controlled clinical trials in children with JIA-related uveitis to provide the scientific best evidence in the areas of diagnosis, screening, disease activity and treatment to enable the optimal care of these patients. 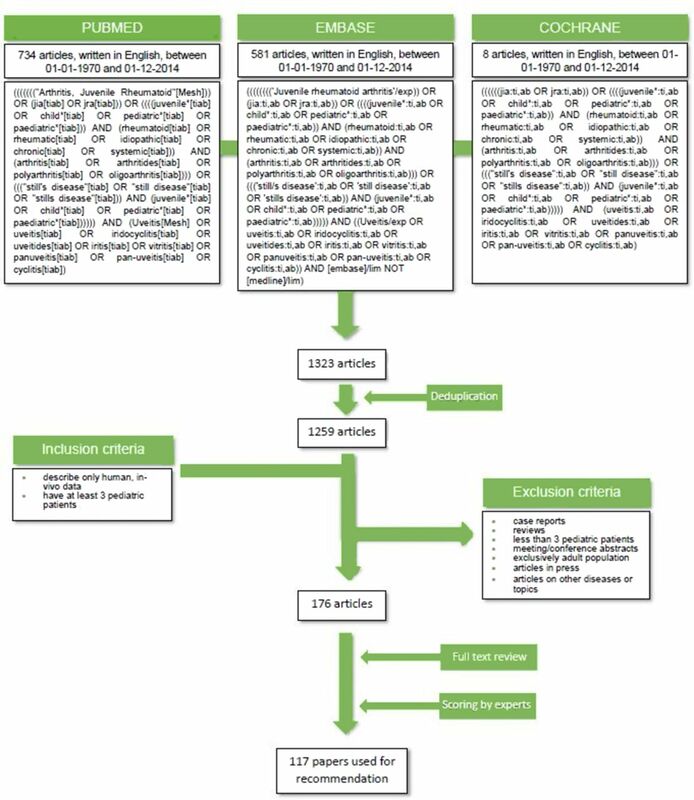 Following a systematic review of the literature and Nominal Group Technique methodology, under the auspices of SHARE and EULAR operating procedures, 22 recommendations for the screening, diagnosis, disease activity monitoring, treatment and future plans for children with JIA-associated uveitis were accepted with at least 80% agreement. In a disease setting where the evidence base is limited by small numbers of patients, and which is developing rapidly, these expert recommendations should help specialists with the evidence-based advice to provide optimal care for their patients. It should be noted that, in general, the level of evidence was quite low with 13 of 22 recommendations being level 3 or 4, seven level 2 and only two level 1. This highlights the need for more research in this clinical setting where a number of new therapies, particularly biological agents, have been introduced in recent years. At the time that the data search for this article took place, the expert group noted a need for more well-controlled clinical trials in children with JIA-related uveitis. The goal being to ensure that scientific best evidence is used to support optimal treatment. In the interim period, but clearly outside the search time frame of this review, a well-designed randomised controlled trial (RCT) has been published which compared adalimumab with placebo in children with JIA-related uveitis who were taking a stable dose of MTX.135 Active treatment was shown to control inflammation and was associated with a lower rate of treatment failure compared with placebo. These results do not alter the recommendations of the expert group, but reinforce the intent of recommendation 15 in table 3: ‘In case of methotrexate inefficacy or intolerance, adding or switching to biological treatment is recommended’. The only difference being that this recommendation is now supported by level 1 evidence, rather than level 3 evidence. More recently, another smaller RCT of adalimumab has also been published showing efficacy of adalimumab in JIA–uveitis although this study used flare as the primary outcome measure.143 The utility of biological therapies is receiving wider attention, for example, a number of studies have reported the benefits of tocilizumab.141 144 These findings from outside the systematic data search time period emphasise the need to regularly update the recommendations of the JIA-associated uveitis expert group so as to provide the highest levels of care in this clinical setting. The SHARE initiative has been endorsed by the executive committee of the Paediatric Rheumatology European Society and the International Society of Systemic Auto-Inflammatory Diseases. Editorial assistance was provided by Steve Clissold PhD (Content Ed Net, Spain).
. Antibodies to iris and retina detected in sera from patients with juvenile rheumatoid arthritis with iridocyclitis by indirect immunofluorescence studies on human eye tissue. J Rheumatol 1989;16:1074–8.
. Longitudinal analysis of HLA associated risks for iridocyclitis in juvenile rheumatoid arthritis. J Rheumatol 1991;18:1394–7.
. The iridocyclitis of early onset pauciarticular juvenile rheumatoid arthritis: outcome in immunogenetically characterized patients. J Rheumatol 1992;19:160–3.
. Antibodies to the 45 kDa DEK nuclear antigen in pauciarticular onset juvenile rheumatoid arthritis and iridocyclitis: selective association with MHC gene. J Rheumatol 1997;24:560–7.
. Early predictors of severe course of uveitis in oligoarticular juvenile idiopathic arthritis. J Rheumatol 2002;29:2446–53.
. Visual prognosis in children with chronic anterior uveitis and arthritis. J Rheumatol 1994;21:2370–5.
. Subtypes of HLA-DRB1*03, *08, *11, *12, *13 and *14 in early onset pauciarticular juvenile chronic arthritis (EOPA) with and without iridocyclitis. Clin Exp Rheumatol 1994;12(Suppl 10):S7–14.
. Uveitis as a marker of active arthritis in 372 patients with juvenile idiopathic seronegative oligoarthritis or polyarthritis. Clin Exp Rheumatol 2002;20:109–12.
. Serum antiocular antibodies in patients with juvenile rheumatoid arthritis. J Pediatr Ophthalmol Strabismus 1993;30:243–8.
. Prognostic value of antinuclear antibodies in juvenile idiopathic arthritis and anterior uveitis. Results from a systematic literature review. Acta Reumatol Port 2014;39:116–22.
. Prevalence and outcome of juvenile idiopathic arthritis-associated uveitis and relation to articular disease. J Rheumatol 2007;34:1139–45.
. Autoantibodies to chromatin: prevalence and clinical significance in juvenile rheumatoid arthritis. Clin Exp Rheumatol 2004;22:499–501.
. Occurrence and management of ocular hypertension and secondary glaucoma in juvenile idiopathic arthritis-associated uveitis: An observational series of 104 patients. Clin Ophthalmol 2007;1:455–9.
. Antibodies to a 15 kD nuclear antigen in patients with juvenile chronic arthritis and uveitis. Invest Ophthalmol Vis Sci 1992;33:1657–60.
. The evaluation of uveitis in juvenile idiopathic arthritis (JIA) patients: are current ophthalmologic screening guidelines adequate? Clin Exp Rheumatol 2008;26:367–72.
. The frequency and outcome of uveitis in patients with newly diagnosed juvenile idiopathic arthritis in two 4-year cohorts from 1990-1993 and 2000-2003. Clin Exp Rheumatol 2014;32:143–7.
. Outcomes of treatment with immunomodulatory therapy in patients with corticosteroid-resistant juvenile idiopathic arthritis-associated chronic iridocyclitis. Ocul Immunol Inflamm 2005;13:353–60.
. Tumor necrosis factor-alpha blocker in treatment of juvenile idiopathic arthritis-associated uveitis refractory to second-line agents: results of a multinational survey. J Rheumatol 2007;34:1146–50.
. Low-dose methotrexate in the treatment of severe juvenile rheumatoid arthritis and sarcoid iritis. J Pediatr Ophthalmol Strabismus 1999;36:125–8.
. Methotrexate is an effective treatment for chronic uveitis associated with juvenile idiopathic arthritis. J Rheumatol 2005;32:362–5.
. Sulphasalazine therapy in chronic uveitis of children with chronic arthritis. Asian Pac J Allergy Immunol 1997;15:71–5.
. Anti-adalimumab antibodies in juvenile idiopathic arthritis-related uveitis. Clin Exp Rheumatol 2017;35:1043–6. Contributors AVR is senior author. NMW and SJV designed the SHARE initiative. AP, VB, A-MH, ZG and RK performed the systematic literature review, supervised by SJV, JdB and NMW. Validity assessment of selected papers was done by TC, IF, JA, JdB, SC-G, CE, RG, AH, CAP, GS, YU, NMW, KW and SJV. Recommendations were formulated by TC, GS, YU, RG and JdB. Provisional recommendations were reviewed by a panel of three experts (IF, NMW and JdB). The expert committee consisted of IF, JA, JdB, SC-G, CE, RG, AH, CAP, GS, YU, SJV and NW; they completed the online surveys and/or participated in the subsequent consensus meeting. AR assisted in the preparation of the live consensus meeting and facilitated the consensus procedure using nominal group technique. TC and AVR wrote the manuscript, with contribution and approval of all coauthors. Funding Literature search in the preparation of the manuscript was supported by an unrestricted grant from Abbvie. Prof Ramanan is Co-Chief Investigator of APTITUDE Study funded by Arthritis Research UK (Grant Ref 20659). Competing interests AH: research grants from BMBF, Pfizer and Novartis and honoraria from AbbVie, Alimera Sciences, Allergan, MSD Sharp and Dohme, Pfizer, Santen, and Xoma. JdB: lectures and advisory board sponsored by AbbVie. SC-G: Pfizer, occasional consulting and registration fees to EULAR/PReS congress and Novartis, registration fees for PReS. IF: advisory board: Abbvie, Novartis, Chugai, Lilly, Medac, Genentech, Bayer. CE: Abbvie: receipt of honoraria and travel expenses. JA has received research grants, speakers bureau or has participated in advisory groups for Abbvie, Pfizer, Roche and BMS. CAP, educational sponsorship from Abbvie. AVR, co-chief investigator of Sycamore Study (funded by NIHR and ARUK). Honoraria/speaker fees from Abbvie, Roche, Lily, UCB and SOBI.